The fifth China Zhijiang International Peace and Culture Festival began on Saturday in Zhijiang Dong Autonomous County in Hunan Province, central China. 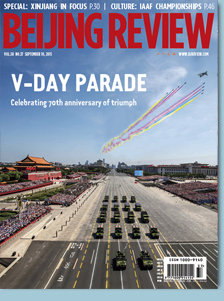 As this year coincides with the 70th anniversary of the World War II victory, the widow of U.S. Gen. Claire Lee Chennault, the leader of the "Flying Tigers" air squadron, Anna Chan Chennault, and former members of Flying Tigers attended the festival. On August 21, 1945, Japanese representatives in Zhijiang signed a surrender memorandum, just days before Japan signed the formal surrender on board the USS Missouri in Tokyo Bay on September 2. The American Volunteer Group, called the Flying Tigers by the Chinese for their courage, was formed in 1941 under the leadership of Chennault to help China drive out the Japanese. "I'm not a hero. I'm just a man who had participated in the war," said Paul Crawford, 91, a member of the Flying Tigers. Crawford remembers how he and his fellow soldiers were rescued by Chinese after their plane was shot down by the Japanese. "The Chinese people are nice and friendly." An estimated 2,264 American Flying Tigers, and more than 900 Chinese aviators who fought alongside with them died during the war. According to James Whitehead, chairman of the Flying Tiger Historical Organization board, about 90 percent of the team received care from Chinese residents during the war. "Without mutual help and support, we couldn't have won the war," Whitehead said. Anna Chan Chennault, 90, visited Zhijiang after 20 years. "We are gathered here at Zhijiang, a place with such an important history, believing that we can continue to cooperate with each other and do more to maintain world peace," she said at the opening ceremony of the festival. The first festival was in 2002 in Zhijiang.